You might think that Gizmodo isn’t typically a cute animal blog. But there is currently a pair of penguin eggs at the National Aviary in Pittsburgh that is about to hatch, under the watchful eyes of adorable penguin parents Sidney and Bette. And you can watch it live. Penguin parents, Sidney and Bette, laid two eggs on November 7th and 11th. The first egg is expected to hatch between December 14 and 18, and the second egg is expected to hatch between December 18 and 22. 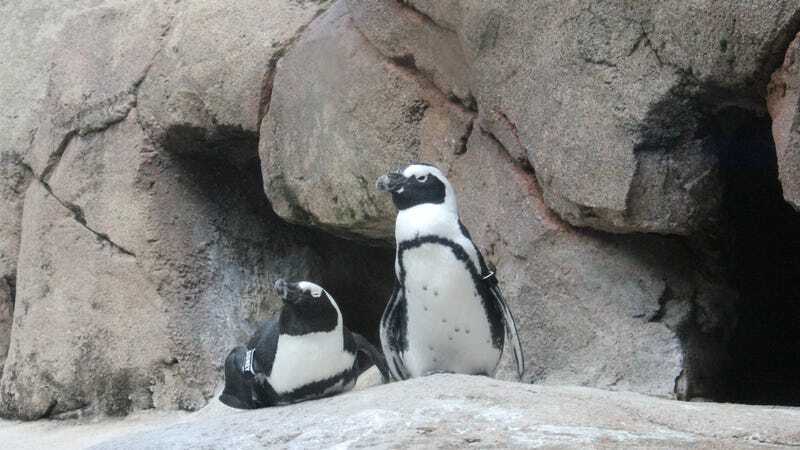 If all goes well, the chicks will eventually join the National Aviary’s current colony of 20 African Penguins. This is the fourth set of chicks for Sidney and Bette who have had 6 chicks together at the National Aviary (not including these two)! The National Aviary will leave the penguins in their nests for the first three weeks. If all goes well, they’ll then move them to join the rest of the Aviary’s penguins. The African Penguin is an endangered species whose numbers have been precipitously declining since the 1970s. The penguin population in South Africa dropped from 70,000 pairs to 19,300 pairs in 2015, for example, as reported by the International Union for Conservation of Nature. The global population is estimated to be around 50,000 mature individuals. Major threats include oil spills, and past human removal of poop from beaches to use as fertilizer, depriving the penguins of places to nest. We’ll be watching the feed closely and updating once the penguins hatch. Good luck, little dudes, hope you make it into the world okay! Update 12/15/17, 11:15AM EST: Still no babies from Sidney and Bette. But we did get to ask a few penguin questions to Chris Gaus, Sr. Aviculturist at the National Aviary. Ryan F. Mandelbaum: What makes this hatch exciting? Chris Gaus: This will be our first clutch in three years. It’s always an exciting time when we have chicks hatching, but especially when there’s a gap of time between them... All six of the penguins we’ve hatched so far are from the same penguins, Sidney and Bette. RFM: Do parents take on equal roles raising the babies? CG: With African penguins, it’s an equal role. In the wild, they dig small burrows into beaches, and that’s where the females lay the eggs. The males and females take turns incubating, brooding and feeding the birds. One might be with the chicks for a day or two while the other is out foraging, then they’ll switch places. RFM: How does raising the chicks differ in captivity? CG: They grow very quickly. They reach full maturity at three months old. They’re not cute fuzzballs for very long... My guess is from after three weeks to two months old is when most people consider peak cuteness. After that is when they start to lose the fluffy down feathers. Update 12/18/17, 12:54APM EST: The National Aviary announced that the first of the eggs has hatched. Here’s a video of Bette preening it.